Home › Offenses › Motion Offenses › Open Post Offense, "Double-Up"
Basketball Offense - Open Post Offense, "Double-Up"
"Double Up" is a 5-Out, open post offense used by Coach Sar with his Blue Demon high school boys varsity team. This could be your primary offense, or something that you go to from time to time during a game for various reasons. 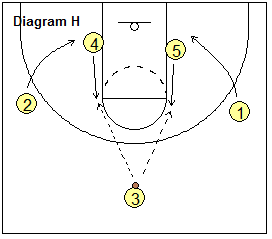 Also, see 5-Out Open-Post Offense and 5-Out Zone Offense (for attacking the 2-3 zone). To change the tempo of the game. To give your more athletic players an opportunity for "takes" to the basket. To create mis-matches on defense. It's a great delay game offense. Opponents hate to play defense against this, which gives you a psychological advantage. Defenses must be very disciplined or you are going to get some great scoring opportunities. It allows you to shoot 3's if the defense gets lazy and sags. It allows for great one-on-one,or two-on-two situations. If the defense overplays, there are opportunities for back-door moves. When you are over-matched size wise, it moves the advantage to you, providing you can handle the ball and read defenses. If can be used at the end of practice for conditioning and fundamentals, both offensively and defensively. Games up to "50", you make the rules. See 50 Points Full-Court Drills. It teaches teamwork and movement without the ball. All players are set above the free-throw line extended. Possible one-on-one takes to the hoop. Pass fake every time you touch the ball. Reverse the ball. Once you get the ball reversing, it is very difficult to cover this offense. Think back-door. Make all back-door cuts all the way to the rim. 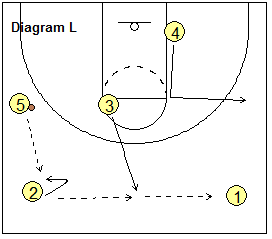 V-cuts to the ball, back-cuts, L-cuts to the mid-court area. On the cut to either half-court or back-door, you must read the defense. The possibilities are endless... use your imagination within the rules. See the diagrams below. The original set is seen in Diagram A. Place your personnel however it best suits your team. The basic two cuts seen throughout this continuity are the cut from the top (O5 in Diagram A), and the following cut by the opposite wing (O4 in Diagram A) to the ball-side elbow. The O5 top cut is made first, and then O5 moves to the weak-side block. After O5 makes his cut, O4 cuts to the ball-side elbow. 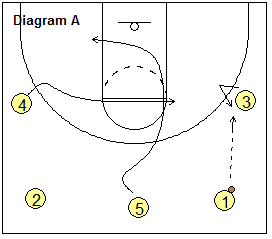 In Diagram B, O4 could receive the pass, cut to the hoop, or cut back out to fill the middle top position, and must read the defense here. 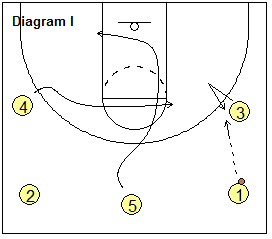 O5 sets a back-screen for O2... this could be very effective if O4 receives the ball on the elbow, and then passes back-door to O2 cutting to the hoop. 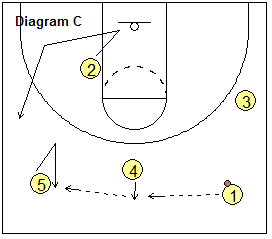 Note in Diagram C that the back-cut goes all the way to the rim, and then the cutter returns and fills the wing spot, while O5 fills the top sideline spot. Optionally, instead of filling the wing position, O2 and O5 can run a counter move where O2 would flash back up to the elbow, and then O5 would cut back-door (similar to what is seen in Diagram H below). Continuity is seen in Diagram D as the ball is reversed. Players must keep moving and make good V-cuts to receive the pass. Make good pass fakes. Keep the ball moving. All players should look for openings and possible takes to the hoop. 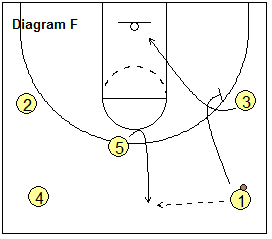 See Diagrams E and F for a couple "specials" to run off this set. In Diagram E, O5 passes to O1, who in turn passes to O3. After the pass is made to O3, instead of cutting through, O5 then sets a screen for O2, who cuts through. 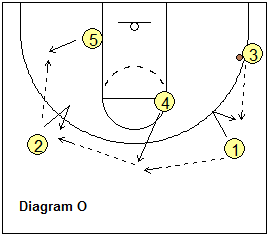 If the defense switches on this screen, O5 should roll off the screen to the hoop. If O2 does not receive the pass, O5 pops back out on top, O2 rotates out to the weak-side wing and O4 moves out to the top weak-side position. 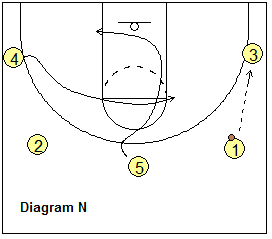 If unable to make the pass to O3, O1 can pass back out to O5 (Diagram F) and set a screen for O3 who now makes the basket cut. Here is another variation called "Counter". This is useful against teams that switch on screens, and is helpful in creating "big-little" (and "little-big") mis-matches for the defense. See Diagrams G and H below. 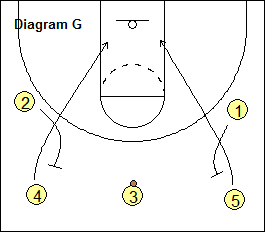 You set up a little differently with O3 on top, your post players on the top sidelines, and your guards (O1 and O2) lower on the wings (Diagram G). 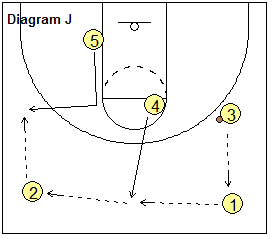 O1 and O2 set back-screens for the post players, who move down to the blocks. Assuming the defense has switched on the screens, the post players now have smaller defenders guarding them. Both posts then flash back up to the elbows (Diagram H), looking for the pass. Meanwhile your quick guards (O1 and O2) who are now being defended by slower post defenders (after the switch) make quick back-door cuts. 1. If you are playing a team that you know traps in the high corners (or if they start to do this), then have the opposite wing player DRAG his man towards the low block and then flash to the middle of the court (wherever the open spot is)... can't really say where that will be as it depends on the defense. This will help relieve pressure and give you a spot to pass to in the middle of the floor. 2. If they trap the wings, have the opposite side wing flash EARLY.... you need someone in the middle of the floor to help relieve pressure. 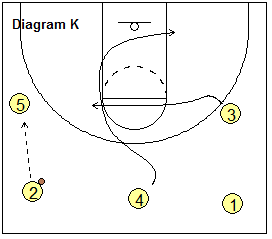 Then the opposite side hi player can cut back door. Scouting reports should be able to prepare you for this. This is something that your team should be prepared for as teams will try to do something to prevent you from holding the ball for any length of time. 1. The same basic set is used (Diagram I below). O5 can pass to either O1 or O2. The entry pass is then made to the wing (either O3 or O4 depending on which side the ball is on). 2. Note the same two basic cuts are used as above. O5 V-cuts to the ball-side block and then moves to the opposite block. O4 V-cuts to the ball-side elbow (Diagram I). Note that these cuts are not made until the wing (O3 or O4) receives the entry pass. 3. 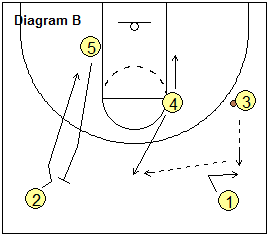 Ball reversal.. See Diagram J. If the cutters do not receive the pass, then O4 moves out to the top middle position and the ball is reversed (O3 to O1, O1 to O4, O4 to O2 and O2 to O5). Also note that the player that occupies the top middle spot can cut and replace himself to get open. 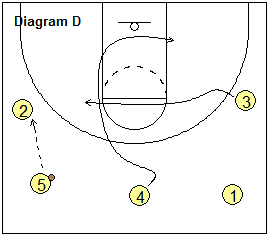 This is a good option when the defense is sagging a lot, and also if you have a good wing that is flashing in the middle to the L and making some things happen. 4. Continuity. Once O5 receives the ball, then O4 now makes the basic top cut to the ball-side block, and then to the opposite block (Diagram K). And O3 makes the cut to the ball-side elbow. Note that these are the same cuts that were previously run on the opposite side in Diagram I. 5. Ball-reversal back. Again, if the cutters do not receive the pass, O3 now pops out to the top middle position and the ball is reversed back around to the original side (Diagram L. O5 to O2, O2 to O3, O3 to O1). 1. Players are encouraged to interchange frequently in order to get to their offensive strengths, so that your post players get inside and your shooters pop outside. 2. Players should pass fake with every touch of the ball, to get the defense to react. 3. The middle top cut must be timed so that the WING player (#3 or #4 above) has the ball first before the cut is made. 4. The timing of the wing to ball-side elbow cut is such that it is made after the initial top cut is made, but not too late, especially against heavy ball pressure (in which case it is better to be early than late). Now look at the diagrams below. 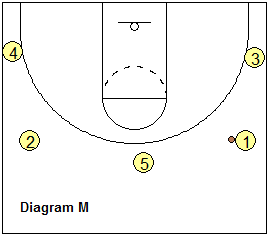 The set can be lowered (depending on the zone you are against) so that all the players are positioned around the three-point arc (Diagram M). Players should hit the gaps and seams. The same basic cuts and movements are used as above (Diagram N). 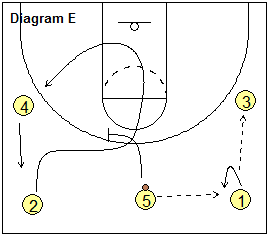 With this set, the post cutter (#5) can hold at the opposite block, and then step out to the short corner on ball-reversal (Diagram O). with Bob Huggins, Head Coach West Virginia. with Jerry Petitgoue, Cuba City HS (WI) Head Boys Basketball Coach, 3X Wisconsin State Championships.